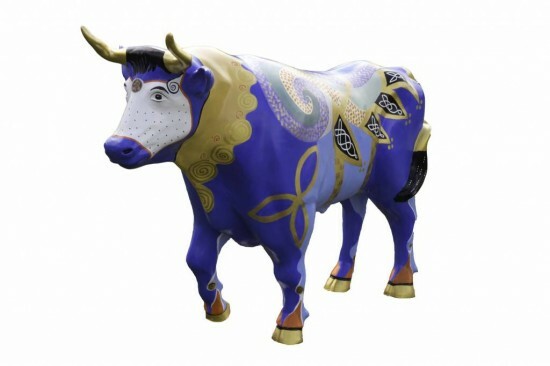 Luke the Celtic Ox is based on a representation from the Book of Kells, an ancient celtic manuscript created in Iona, Scotland in medieval times, and now located at Trinity College in Dublin, Ireland. Luke the Evangelist was often represented as an ox. Throughout history, Luke has been known as both physician healer and artist. The ox also has magical shape-shifting properties and is an important symbol of strength and sovereignty in Celtic Art. The present representation features both traditional and contemporary illumination techniques and symbols including spirals, knots and triskeles. Many design elements are in threes, as the number three holds great significance to the Celtic soul. As the Celts were esteemed goldsmiths, Luke the Celtic Ox features several varieties of gold paint and 23 k gold leaf accents, fitting for his sovereign image. Luke was painted with lukas cryl professional acrylic paints which simulate medieval colors found in the Book of Kells and were chosen for brilliance and color-fastness.